US Navy SEALs and Marine commandos conducted joint special forces training using the Navy's only forward deployed nuclear aircraft carrier, the USS George Washington, as a forward operating base. The training was part of Special Operations Command Pacific's initiative to integrate special operations forces with the carrier and its deployed air wing. "The chance to integrate Special Operations Forces and a carrier strike group in a full scale exercise is incredibly important. Operating from an afloat staging base gives our forces dramatically increased reach and provides an opportunity to refine tactics, techniques, and procedures in a challenging environment. 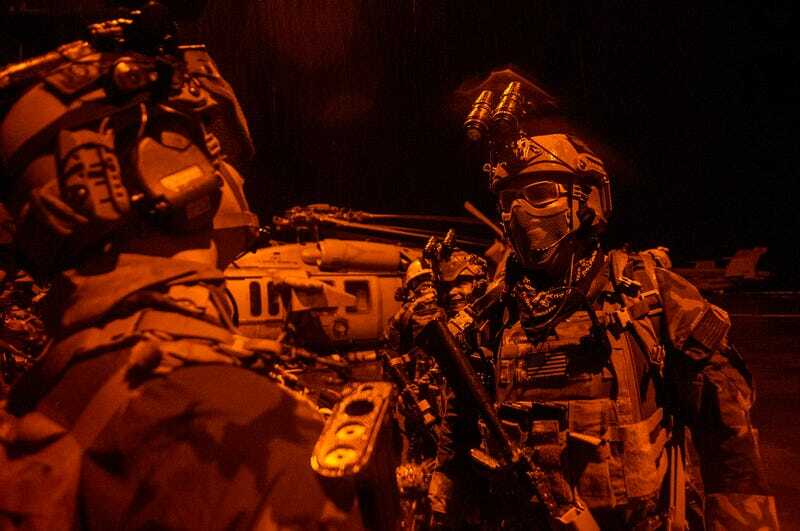 This makes Maritime SOF more effective and provides the requisite experience to conduct real-world contingency operations as needed." According to the DoD, this training exercise represented the full array of special operations, including command and control, logistics, reconnaissance, embarkation, planning, infiltration and air support, much of which utilized capabilities already deployed with CVW-5, the George Washington's resident air wing. "We demonstrated outstanding synchronization between aviation, special warfare and surface forces in an environment that will continue to grow as an option for afloat staging bases. The ability to seamlessly integrate those forces and quickly conduct operations in a time of crises is key to effective cooperative efforts. Exercises of this kind, reinforcing and refining our capabilities, are further evidence of the U.S. dedication to stability and security in the Indo-Asia-Pacific region."